Manifestly haunting, The Map – Chizu 地図 by Japanese photographer Kikuji Kawada 川田喜久治 is a humanitarian cry, and a monumental work. Monumental in both its political message and creative approach to photobook-making. The book is an assemblage of Kawada’s photographic methodology, dealing with the legacy of war and violence; most potently the American bombing of Hiroshima. The book was originally published on 6th August 1965, twenty years to the day after the US released the first nuclear bomb on a populated area. The abstract photographs of walls of the Hiroshima Atomic Bomb Memorial Dome (原爆ドーム) resemble monochromatic maps, echoing the book’s name. As well as disturbing views of Hiroshima, Kawada presents images from military facilities and ruins, with close-ups of discarded objects and memorabilia from the Second World War. Other images record traces of American occupation in post-war Japan, mainly taken in Tokyo. Kikuji Kawada 川田喜久治 was 26 when he began work on this project in 1959 (although the book itself states that the images were taken between 1960-1965). The book was originally intended as a two volume set, but Kawada, together with graphic designer and publisher Kohei Sugiura, finally combined both into one striking volume. The clever use of juxtaposition and montage creates a fascinating and multi-layered book. The book is housed in a delicate natural card slipcase, which, in this context, seems to reflect the fragility of human skin. On removal, a stiff black cardboard envelope protects the fragile book itself. Unfolding the envelope reveals the brown-toned dust jacket. The jacket is illustrated with an abstract close-up photograph of smoke, overlaid with slightly faded words in Japanese and English. Stripping off the dust jacket reveals a simple black cloth-covered book with the titles embossed in white on the spine, like a sombre tombstone. 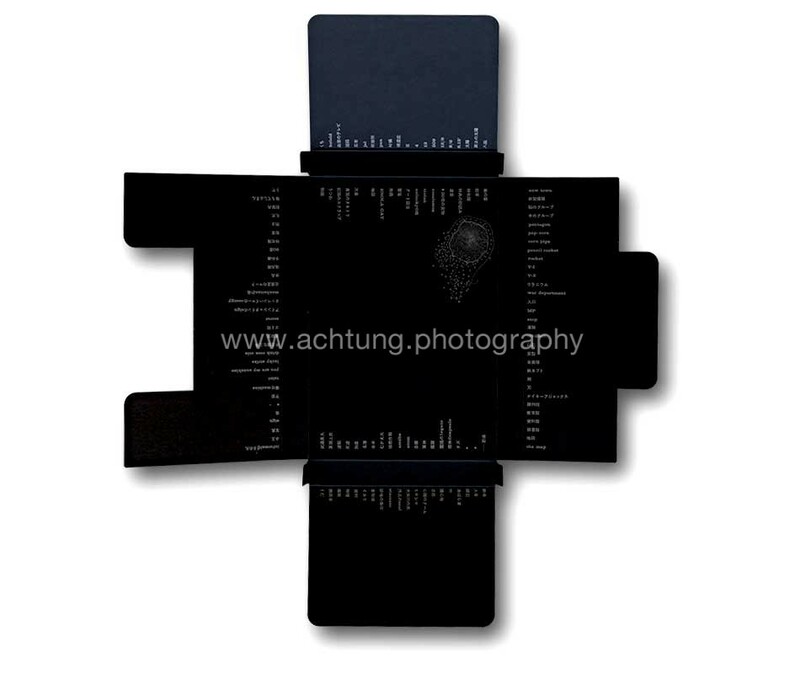 The book is quite small and all images are printed in gravure and in full bleed. Every other page is a double gatefold. This forces the viewer to spend time, carefully inspecting each image. There is a sense of fear and sadness attached to this book. The pages are glued, which dries over the years, so the pages do tend to get loose, but this only encourages viewing the book at a slower and more reverent pace. Book designed by Kohei Sugiura 杉浦康平 (Who also designed Robert Frank’s books The Lines of My Hand (1972), Flower Is (1987), The Americans – 81 Contact Sheets (2009) as well as Eikoh Hosoe’s Barakai (1963), Jun Morinaga’s, Kawa, Ruiei (River, Its Shadow of Shadows) 1960-1963 (1978), Yutaka Takanashi’s Towards the City (1974), Ikko Narahara’s, Europe: Where Time Has Stopped (1967), and Masao Mochizuki’s, Television 1975-1976 (2001)). Hard cover with dust jacket in envelope and slipcase. 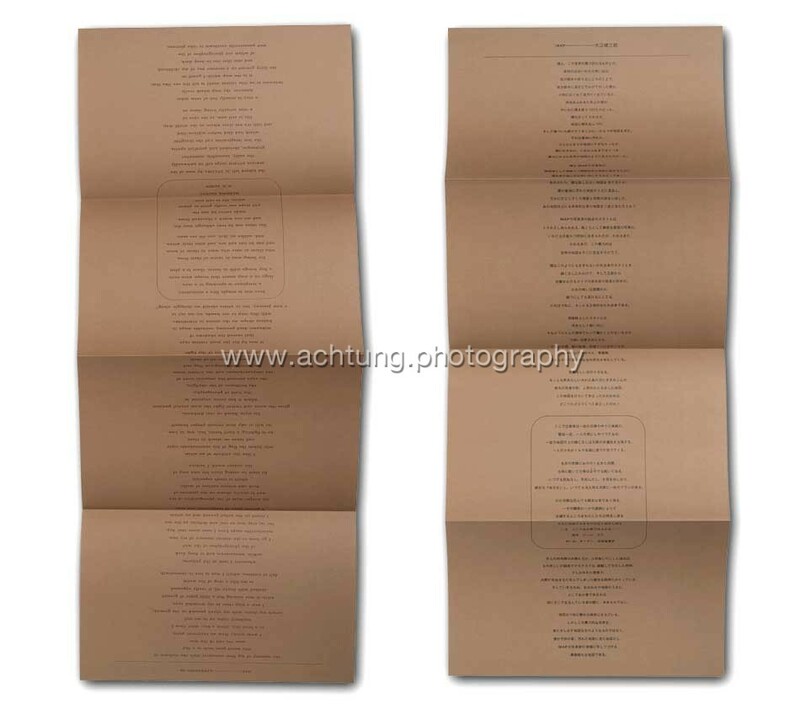 Contains a brown concertina fold insert with a poem by Kenzaburo Oe (in English and Japanese). 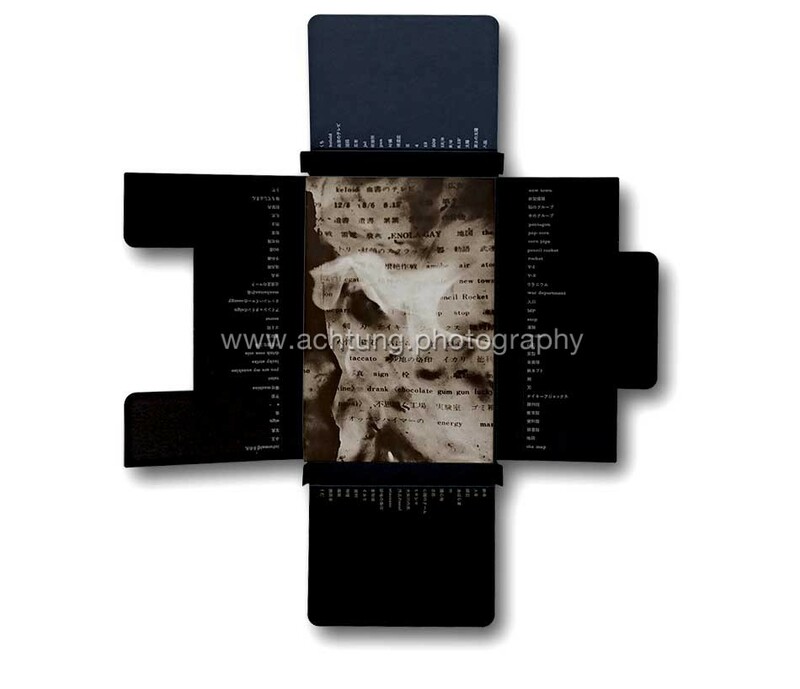 Credits and titles are printed on the inside flaps of the dust jacket. The index of plates is printed on the rear of the dust jacket. Kikuji Kawada, The Map, 1965, dust jacket with credits and titles printed on the inside flaps. 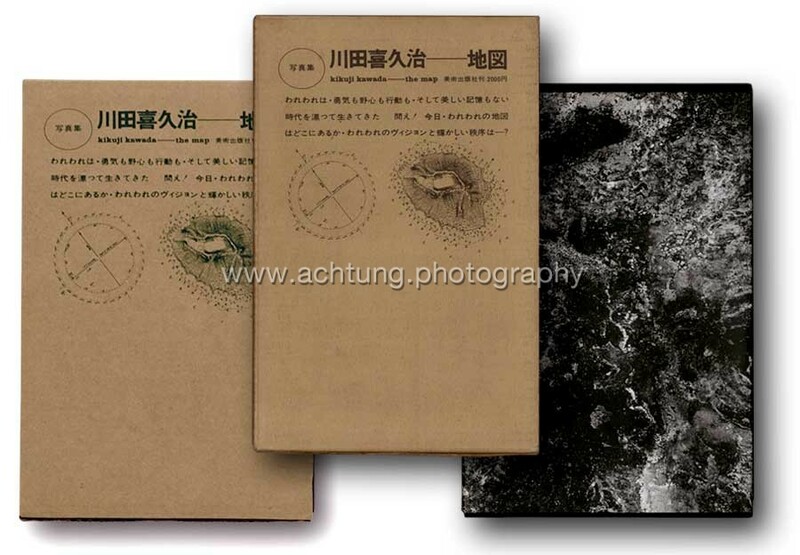 This is the first of two re-editions of Kikuji Kawada’s 川田喜久治, The Map – Chizu 地図. 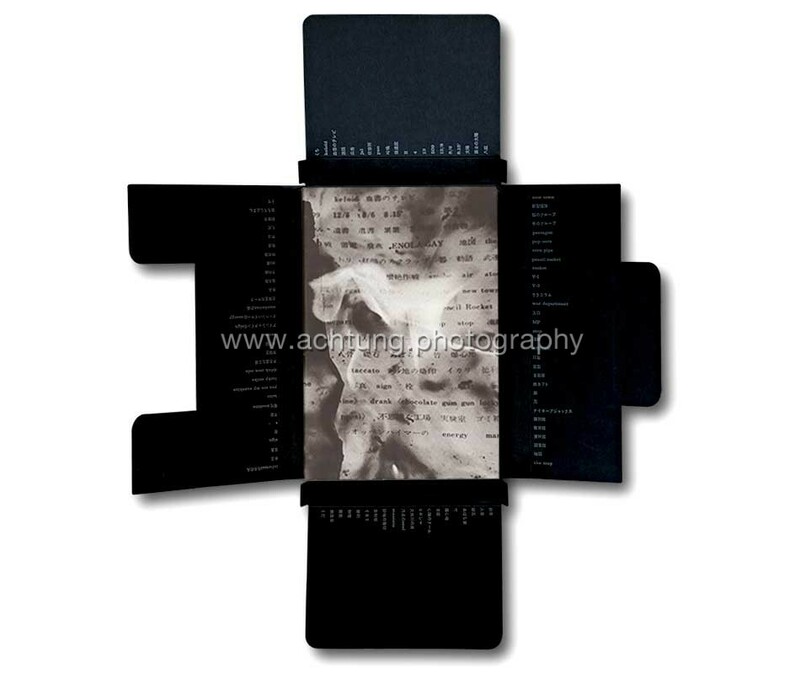 The book was redesigned as a two volume edition housed in a black cloth slipcase with a “dust jacket” wrapped around. The “dust jacket” shows an abstract photograph “The A-Bomb Memorial Dome Ceiling Stain and Flaking”. The author’s name and book title are printed on the spine. The main book, a simple black cloth bound volume, with the title and author’s name embossed in black on the front cover and spine, contains the same photographs as the original 1965 edition. The sequencing and the fold outs are almost identical to the original. There are two obvious exceptions: The image “Fusion by the A-Bomb Thermic Rays. Beers Stoppers“ (pages 123-124) is printed upside down. The image “日の丸 Hinomaru – The Japanese National Flag“ (pages 157-158) is cropped slightly differently. In general, the printing is slightly shinier with a higher contrast than the original 1965 edition. The second volume is a slim softcover brochure, featuring Kawada’s preface, a short poem by W. H. Auden, and an index of the photographs in English and Japanese. This edition is co-published in a total edition of 1000 copies by Nazraeli Press and Getsuyosha Ltd., shared between the two publishers. The text booklet is hand-numbered and the actual book is signed on the endpaper in Kanji by Kikuji Kawada. 500 copies published by Getsuyosha Ltd. Pages 123-124 “Fusion by the A-Bomb Thermic Rays. Beers Stoppers“ is printed upside down. Pages 157-158. “日の丸 Hinomaru – The Japanese National Flag“ is cropped slightly differently. Kikuji Kawada, The Map, 2005. Brochure, featuring Kawada’s preface, a short poem by W. H. Auden, and an index of the photographs and the edition number. The 2014 edition of Kikuji Kawada’s 川田喜久治, The Map – Chizu 地図 is a facsimile reprint true to the original published in 1965. The printing has slightly less contrast than the first edition and therefore reveals more details in the images. This is possibly the closest one can get to gravure printing today. Published by Akio Nagasawa Publishing in an edition of 600 copies. A white paper slip with the handwritten edition number, a red stamp and Kikuji Kawada’s 川田喜久治 signature is pasted onto the endpaper of the book. Hard cover with dust jacket in envelope and slipcase with black outer slipcase. Contains a brown concertina fold insert with a poem by Kenzaburo Oe (in English and Japanese), and a black card with an introductory text by Kikuji Kawada (in English and Japanese). Credits and title are printed on the inner flaps of the dust jacket. The index of plates is printed on the rear of the dust jacket. Kikuji Kawada, The Map, 2014. Paper slip with edition number, a red stamp and Kikuji Kawada’s signature. Kikuji Kawada, The Map, 2014, Concertina fold insert with a poem by Kenzaburo Oe.